The Razer Phone has received an update weighing in at 249MB that makes it the best smartphone for Netflix-addicted streamers. The update brings Netflix HDR to the handset, which is the only phone in the world to support it. Combined with the phone's zippy refresh rate of 120Hz and the Dolby 5.1 audio playback for Netflix that is part of the update, the Razer Phone is a binge watcher's best mobile friend. The update also helps fix the cameras on the phone, including the 12MP and 13MP dual camera setup on back (f/1.8 and f/.2.6, respectively). Make sure that you go to the Google Play Store to update the Razer Camera app after installing the update. The January Android Security patch is included with the new files, which reach the device OTA. The patch helps protect the phone from the Meltdown and Spectre flaws. While Android 7.1.1 is still running the show, Android 8.0 should be pushed out sometime this quarter. When you receive the notification that the update has arrived on your Razer Phone, make sure that you're on a Wi-Fi network before downloading and installing it. You should also make sure that your battery is fully charged before starting the updating process. Because the update is being disseminated OTA, you might have to wait until it hits your Razer Phone. If you're impatient, you can try to manually coax out the update by going to Settings > About phone > System update. Nice. I like this phone and like that they're committed to making it the best media consumption phone available currently. Sadly external DAC provided by Razer keeps this phone from having good headphones source as well. Still you can connect something like Dragonfly - but that is extra bucks payed for something phone should do by itself. Plus Android 8 is needed to implement LDAC for best bluetooth codec. Razer Phone does have best speakers on the market, but other than that audio is pretty poor, no dolby certification can save it. I'll be interesting to hear from owners whether the camera is much better. Camera is faster, HDR on the camera is faster, image quality does seem to be better. Not exactly sure about how much, but better. I do seem more please with it in other lighting conditions. It actually does take pretty great photos in like abundant light conditions, like in the summer where it took some better than my HTC U11, and in stores (Took some pics in Meijers, quality was great) but now it seems to have improved in other lighting conditions. The filter glitch seems to be gone. My only issue at the moment is still that both front-facing and rear-facing cameras zoom have this default permanent zoom in video mode. Dolby Digital 5.1? Shouldn't that be Dolby Digital 2.0 because it only has 2 speakers? "..phone's zippy refresh rate of 120Hz..." ...but movies are only in 30fps... so what's the point of this comment? 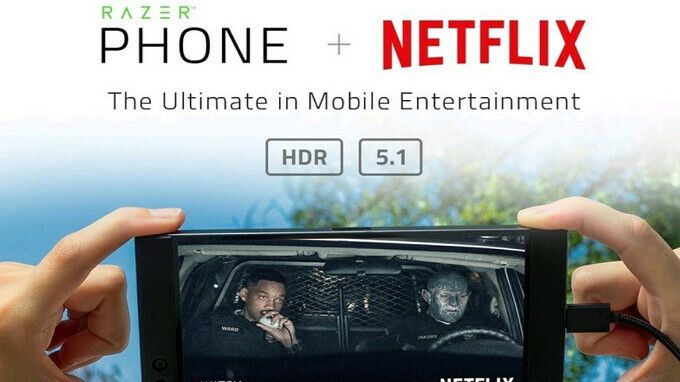 The only phone in the world to support Netflix HDR? That's false!